In our eyes, "To give the life more exciting" is our own expectations, but also is FOXER commitment to all customers. CLASSIC PLAID PATTERN - This leather wallet features slight plaid pattern and exquisite fox zipper puller, classic as well as chic. HIGH QUALITY MATERIAL - Select cow split leather enhances softness and comfort. Polyester silk lining and premium hardware can stay in good condition even if used for a long time. PERFECT SIZE - Measures about 7.5" L x 3.7" W x 1" H when closed, weights about 0.33 pounds when empty. Fits for iPhone 8 Plus. Equipped with detachable wrist strap, more convenient to hold. 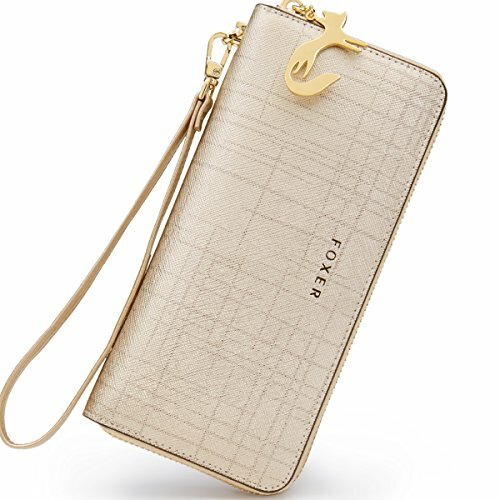 LARGE CAPACITY - Our leather clutch wallet comes with 2 compartments for cash, 8 card slots, 2 bill slots and 1 inner zipper pocket for coin or something else, meeting you daily needs. FREE GIFT-WRAPPING - FOXER women leather wallet comes with our free gift-wrapping. Ideal gift for your friends, family, yourself or for that someone special. If you have any questions about this product by FOXER, contact us by completing and submitting the form below. If you are looking for a specif part number, please include it with your message.